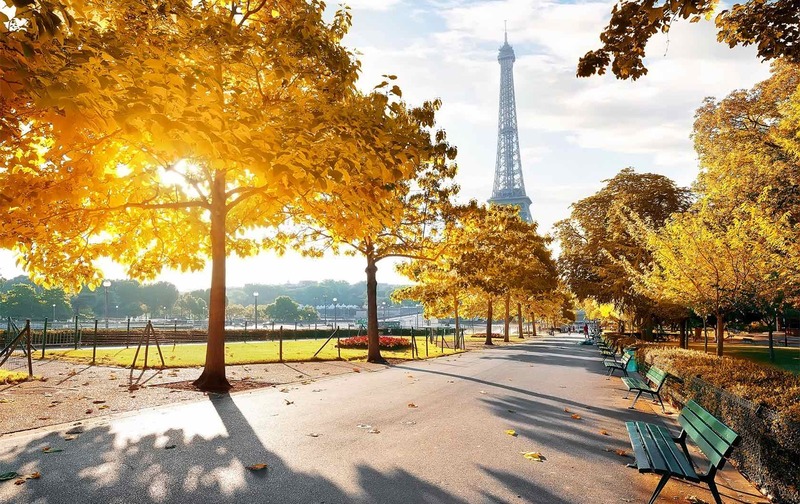 The French capital is famously seductive in spring, but for true romance you can’t beat fall foliage in Paris. 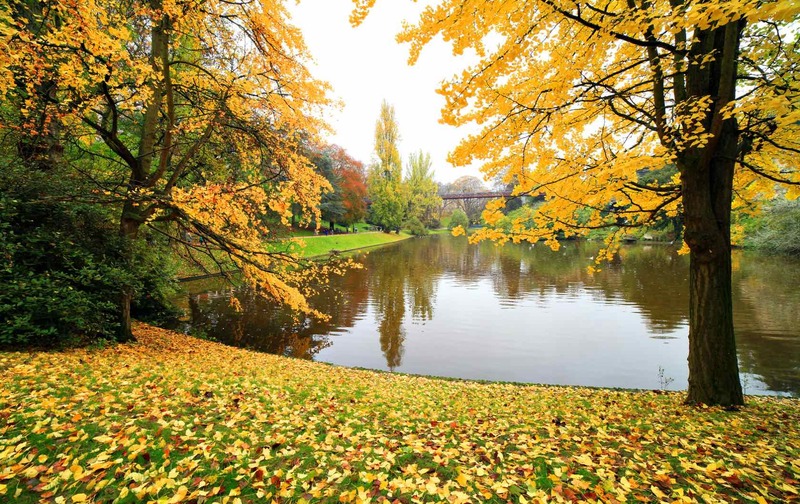 Plan a trip in October or November to spy the city’s autumn leaves turning yellow, orange, red and gold. It’s a dazzling array of color that looks a treat set against elegant architecture and pretty parks. You’ll still get crisp, blue-sky days, perfect for strolling outdoors, then warming up in a cute cafe. 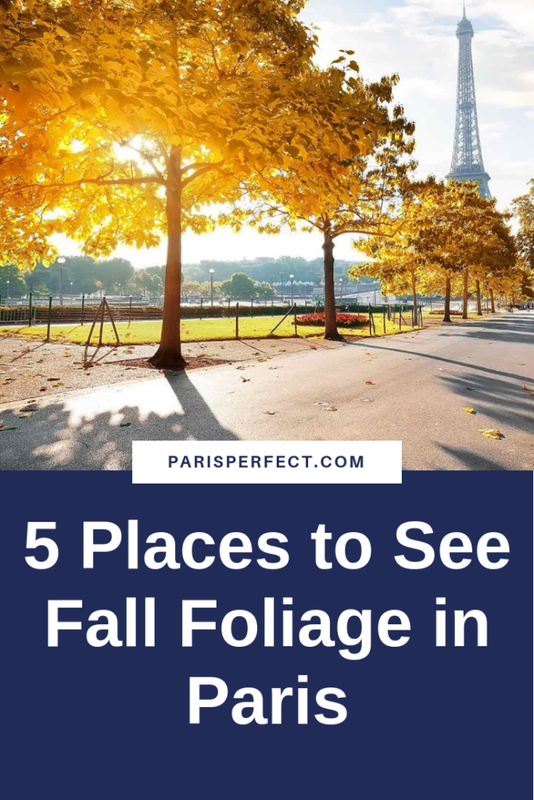 As French novelist Albert Camus once said, “Autumn is a second spring where every leaf is a flower.” Here are our five top spots to see fall foliage in Paris. The super-central Jardin des Tuileries is your postcard-perfect Paris garden. 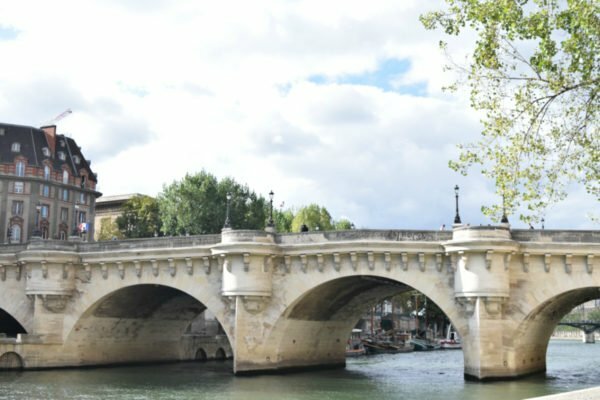 It occupies prime real estate between the Louvre art museum and Place de la Concorde in the 1st arrondissement. Here you can see glorious fall foliage in Paris back dropped by chic buildings, ornamental ponds, historic fountains, statues and urns. Founded by Queen Catherine de Medici in 1564, it was named after the tile factories that once dominated this site. 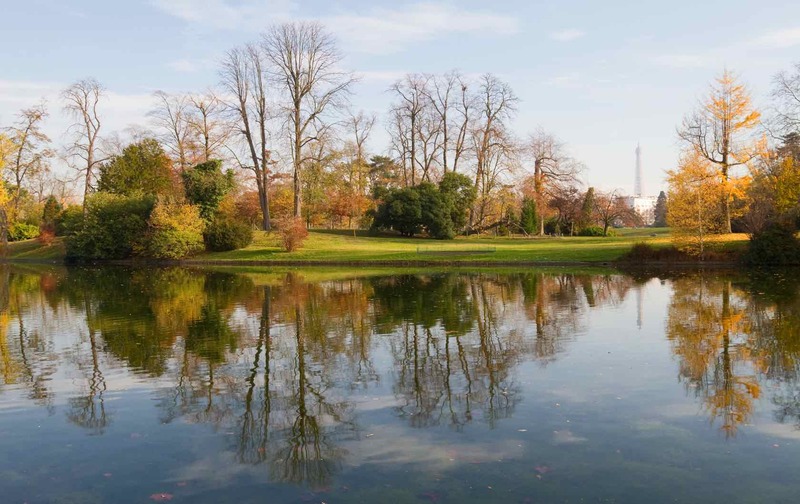 Paris’s oldest park is famously ornamental, laid out in formal French style. Even the green metal park chairs are easy on the eye, so kick back and savour those autumnal scenes. Think more than 35 species of tree! You can also take in the lovely leaves from the terrace of the garden’s Café des Marronniers. It serves fall warmers such as French onion soup with a cheese topping, crêpes and mulled wine. The hot chocolate with tarte Tatin is mighty tempting too. 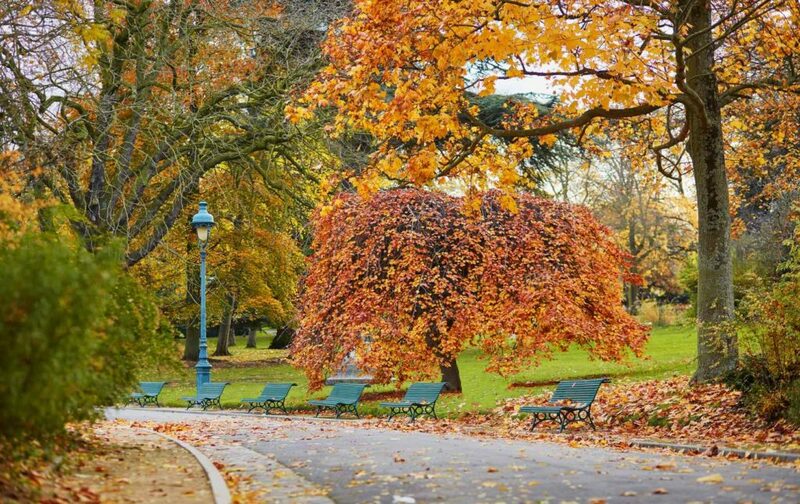 Escape the tourist crowds at north-east Paris’ verdant Parc des Buttes-Chaumont, a 61-acre sprawl of hilly greenery. In the 19th district, it’s dotted with around 50 species of local and exotic trees, shrubs and plants. A former quarry turned garden showcase in 1867, this dramatic park is full of Victorian charm. There’s a man-made lake, cascading waterfalls, grottoes, scenic bridges, landscaped slopes and lofty lookouts. Explore the Roman-inspired miniature Temple de la Sibylle, atop a rocky cliff on the summit of the lake’s Belvédère Island. This is the city’s fifth largest park, so you should find plenty of space to relax in private. Take a picnic and a flask of hot coffee – or a warming bottle of red. You’ll enjoy stellar views over Montmartre to the west from a grassy perch. The park’s Le Pavillon du Lac and Rosa Bonheur also offer tasty bites and drinks. Instagrammers can snap up reflections of golden-yellow trees in the lake water. Dreamy doubles! 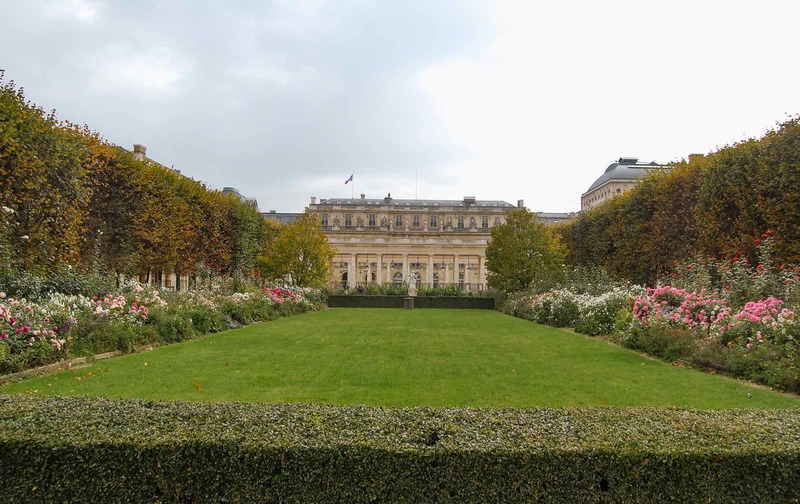 Neoclassical Palais-Royal is home to a courtyard and beautiful gardens, open daily, lined with gorgeous trees and clipped topiary. This former royal palace in the 1st arrondissement was originally built for Cardinal Richelieu in 1639. It’s a stroll from the Louvre but this tranquil ‘village in the city’ is a bit of an insider secret. It combines 17th-century arcades of luxury shops with contemporary sculptures by Daniel Buren (look for the black and white columns). There are also romantic formal gardens and flowers. Head for the Jardin du Palais-Royal where you can pose by flirty fountains and wander leafy paths. The manicured lawns, boxed hedges and tidy terraces are even more Insta-worthy in fall. Afterwards, hit the trio of arcades fringing the gardens – Galerie de Montpensier, Valois and Beaujolais – for upscale shopping. Then relax at cute Café Kitsuné (51 Galerie Montpensier). French royals once hunted in the Bois de Boulogne, an ancient oak forest. 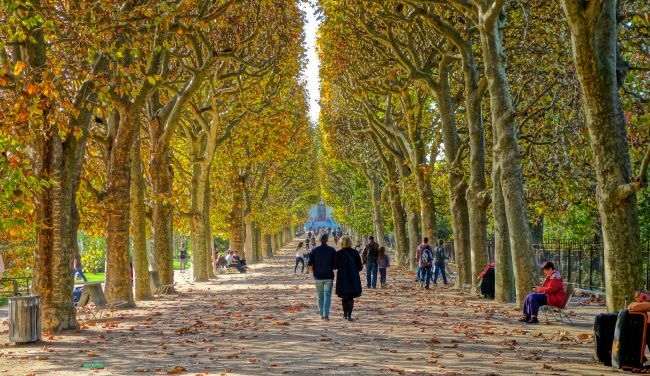 Now these vast green lungs are the perfect destination for discovering vibrant fall foliage in Paris. Head to the western edge of the 16th arrondissement to explore 2,088 acres of public park and hunt for photo opps! Paris’s second largest park is about two and a half times bigger than New York’s Central Park. Highlights include neoclassical Château de Bagatelle, lakes (with row boats for hire), greenhouses, and leafy paths for strolling or cycling. Kids will also love the zoo and amusement park Jardin d’Acclimatation, which charges an entry fee. Greenery spans an English landscape, botanical and French-style gardens, with trees turning into a riot of colour come fall. The 1953-founded Shakespeare Garden in the Pré-Catelan area includes all the trees, bushes and flowers mentioned in his plays. Artists Manet, Renoir and van Gogh painted the fascinating life of this park. It can get seedy at night though, so visit during daylight hours. 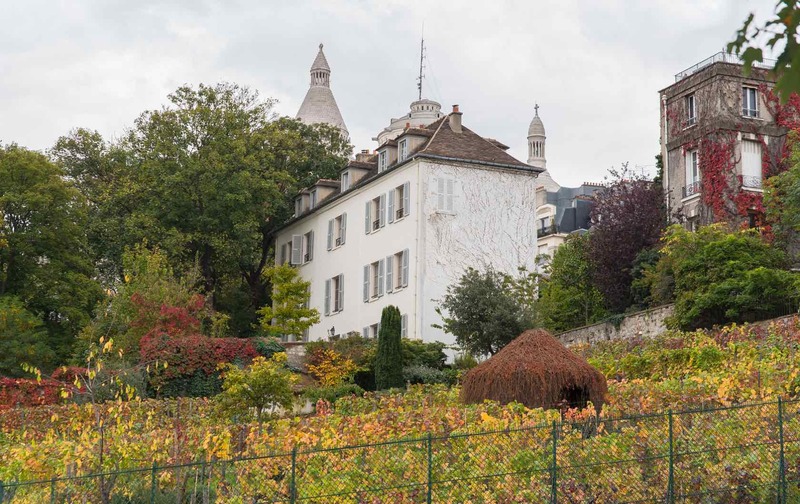 Rustic Montmartre in the 18th was once dotted with windmills and vineyards, and still boasts striking trees and ivy-clad architecture. This hilly northern quarter is famous for its white domed Sacré-Coeur Basilica (meaning ‘Sacred Heart’). Your heart will beat faster when you spy the lovely old buildings, squares, skinny streets and parks peppering the neighborhood. Start at Square Louise Michel park, created in 1927, which extends up Montmartre Hill. There are 222 steep steps up to Sacré-Coeur or take the gentle, sloping paths up beside the gardens. Trees include horse chestnuts, figs, magnolias, wing nuts, honey locusts and orange trees, with exciting fall leaf action aplenty. Montmartre Funicular also departs from here. Cobbled, hilltop Place du Tertre is flanked by cafe terraces, ideal for sipping coffee while watching artists painting visitors’ portraits. The square’s elegant trees get a cameo role in landscape pictures, which you can snap up to take home. It’s a tourist magnet, so for quieter fall foliage in Paris make for atmospheric Cimetière de Montmartre. This serene cemetery teams historic tombs with dreamy trees. 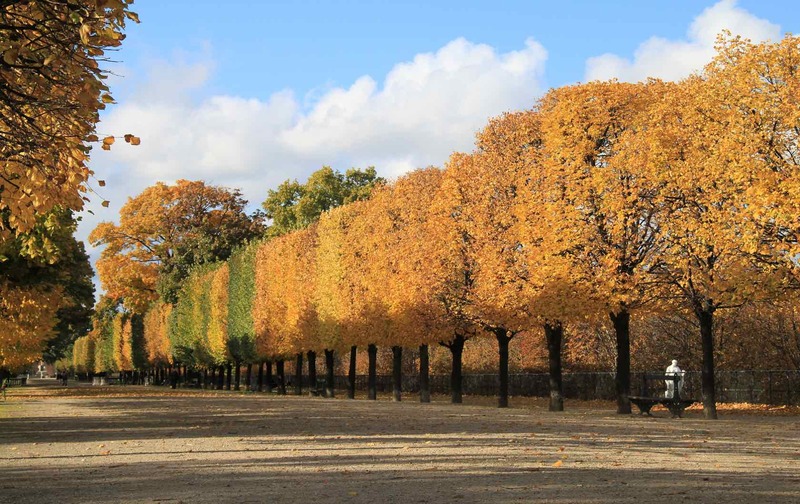 Paris Perfect has a vast selection of apartments in the best locations for experiencing the fall foliage in Paris. Click here to browse all of the beautiful apartment choices! Call 1-888-520-2087 from the USA or email [email protected] for our apartment reservation team. Posted on Tuesday, October 2nd, 2018 at 3:34 am in Parisian Living. You can follow any responses to this entry through the RSS 2.0 feed. You can skip to the end and leave a response. Pinging is currently not allowed.